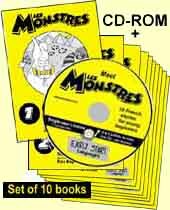 "Les Monstres', is a collection of simple stories to share with the whole class on your Interactive Whiteboard or data projector . YOU control the pace of the story - as it's read by a cast of native speakers. YOU give children opportunities to discuss, anticipate and join in. "To learn a FL successfully the child must hear and repeat it continually, revisiting the language in different contexts." 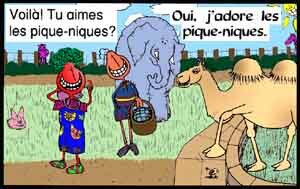 with no unfamiliar phrases or tenses..
as they see how how much they can understand. 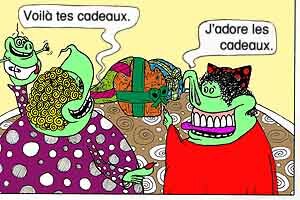 In Story 1, "Interview d'un monstre", Rabbit records an interview with the French monster Agadougou. 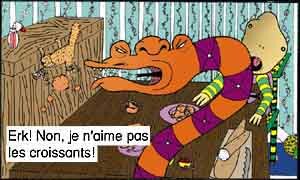 In Story 4, "Le mystère des numéros", Pic and Pac get lost in a Labyrynth (a sort-of maze), and find that the only way out is to solve mathematical puzzles. Children can make a rhyme about their monsters. 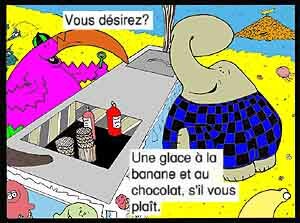 Children can draw a map to help people find their "lost monster"..
Children can make an ice-cream stall price-list with all the flavours - in French - that THEIR monster would like to eat. 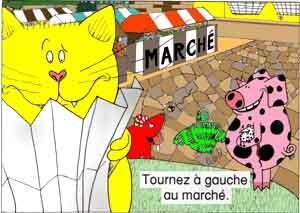 In Story 3, "Clara le cochon", Kim and Fredo search for a missing pig. Before they find Clara, they come across a zoo full of strange "mixed-up" animals - hybrids that are half of one species and half of another. Children can draw and name their mixed-up animal. 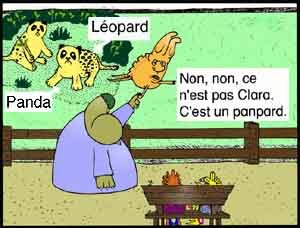 The Teacher's Guide has plenty of ideas for class activities to use the stories to complement and add variety to your language course. It shows you can use the texts and content of the stories in line with the QCA MFL KS2 Framework - with references to particular strands, including Literacy, Oracy , Knowledge about Language and Inter-Cultural Understanding. Find out all you can do with the stories, including a mine of teaching ideas from Rosemary Bevis, the well-known expert primary languages practitioner, consultant and author. NEW! Download links to the KS2 Framework Learning Objectives HERE, to help save you time in documenting your lesson planning. What customers say about this product. Have you bought this product? + another set of books FREE! + TWO sets of printed books FREE! Pay by credit card for INSTANT ACCESS to download a story! NB: for INSTANT ACCESS, pay using the WORLDPAY card payment system. Payments made via GOOGLEPAY will take a short time to process.